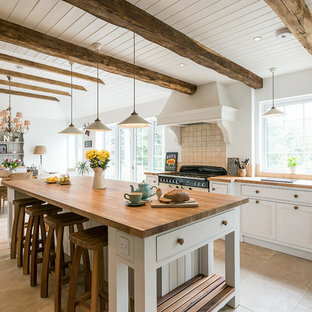 Inspiration for a medium sized country kitchen in Hampshire with a double-bowl sink, flat-panel cabinets, white cabinets, quartz worktops, stainless steel appliances, an island, grey floors, white worktops and white splashback. 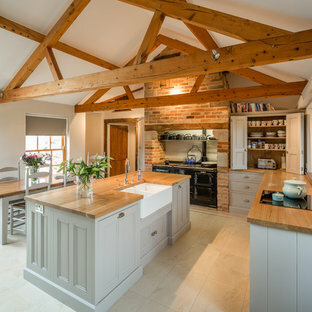 Photo of a medium sized rural u-shaped open plan kitchen in Wiltshire with a belfast sink, shaker cabinets, white cabinets, wood worktops, white splashback, ceramic splashback, black appliances, medium hardwood flooring and beige floors. 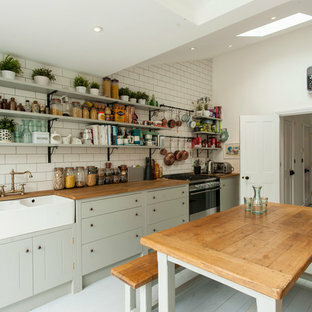 Photo of a small farmhouse u-shaped kitchen in London with a belfast sink, recessed-panel cabinets, white cabinets, wood worktops, white splashback, metro tiled splashback, coloured appliances, light hardwood flooring and a breakfast bar. As featured in The Sunday Times. The owners of this period property wanted to add their own personal stamp without having to choose between design and functionality. 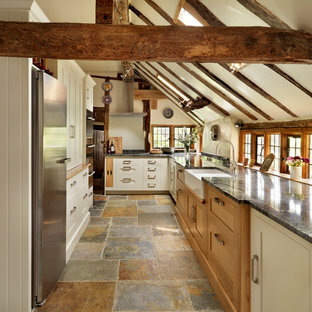 Hill Farm offered practical solutions without compromising on style or space – side-by-side under counter fridges, bi-fold doors with adjustable shelves, maximum work space – created from solid wood and hand painted. 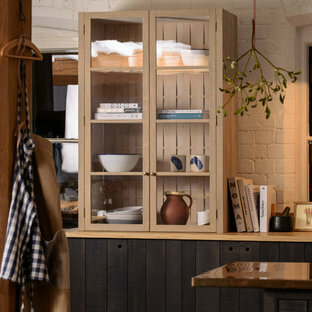 Orford | A classic country kitchen with coastal inspiration. A large island occupies the centre of the room, under the vaulted ceiling. This generously sized island provides lots of extra workspace as well as a sociable area for friends and family to gather in this open plan kitchen, dining, living area. 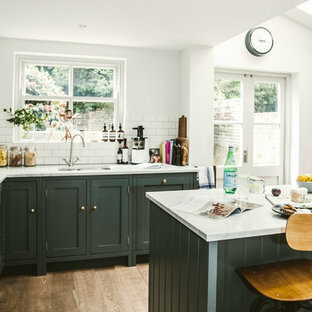 The conservatory adjoined to the kitchen enhances the general light and fresh feel of the whole design, emphasising the property's country, coastal location. This is an example of a rural kitchen in Other. 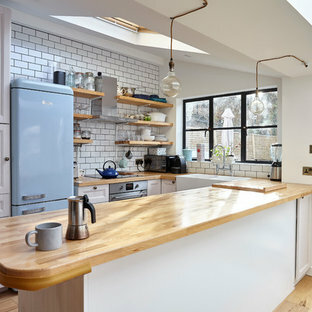 This is an example of a medium sized rural u-shaped kitchen in London with a belfast sink, shaker cabinets, white cabinets and stainless steel appliances. 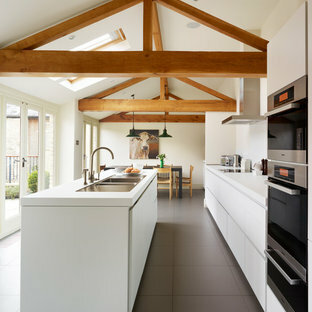 Medium sized country l-shaped kitchen in Hertfordshire with a submerged sink, recessed-panel cabinets, grey cabinets, wood worktops, white splashback, stainless steel appliances, an island, grey floors and beige worktops. Nickel fittings and traditional sanitaryware were added to pull the scheme together. Marble floor tiles bring a sense of luxury and provide cohesion with the kitchen below. Design ideas for a large country kitchen/diner in London with a belfast sink, beaded cabinets, white cabinets, beige splashback, ceramic splashback, ceramic flooring and an island. 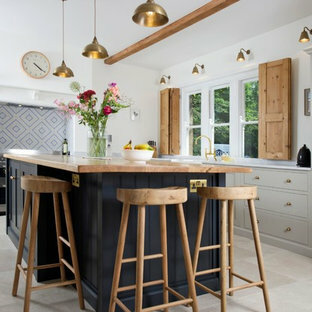 Photo of a large farmhouse l-shaped kitchen in Kent with blue cabinets, wood worktops, black appliances, an island and shaker cabinets. Madisonville Farmhouse Kitchen | Custom Amish Cabinets. beautifully handcrafted, painted and glazed custom Amish cabinets. This is an example of a medium sized rural l-shaped kitchen/diner in Other with distressed cabinets, stainless steel appliances, a belfast sink, an island, raised-panel cabinets, soapstone worktops, grey splashback, ceramic splashback, dark hardwood flooring and brown floors. Design ideas for an expansive country kitchen pantry in Chicago with a double-bowl sink, recessed-panel cabinets, white cabinets, marble worktops, white splashback, ceramic splashback, stainless steel appliances, porcelain flooring, an island and brown floors. This is an example of a large rural open plan kitchen in Philadelphia with a belfast sink, shaker cabinets, engineered stone countertops, red splashback, brick splashback, integrated appliances, light hardwood flooring, an island, green cabinets, beige floors and white worktops. 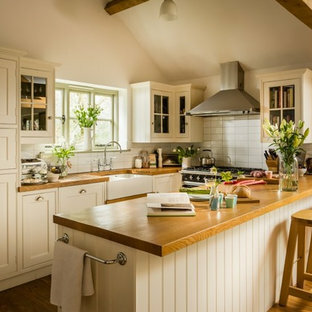 Inspiration for a large rural l-shaped kitchen pantry in Portland with open cabinets, white cabinets, engineered stone countertops, white splashback, dark hardwood flooring, no island, brown floors and white worktops.